University of Lynchburg in St. Lucia received an impressive “no recommendations” from a five-person panel of the Southern Association of Colleges and Schools Commission on Colleges, who conducted a site visit in September 2014 at LC’s new off-site campus on the island. “We are extremely pleased that the SACSCOC review went well,” said Dr. Edward Polloway, dean of graduate studies and vice president for community advancement. “The team did a thorough review of our LC in St Lucia program, and their finding of no recommendations confirms our commitment to quality in this off-site program.” Dr. Polloway oversees the St. Lucia program and has been the driving force in establishing the LC-St. Lucia partnership. The decision to establish the off-site campus was an outgrowth of more than 10 years of collaboration with the nation of St. Lucia that included a variety of educational initiatives. 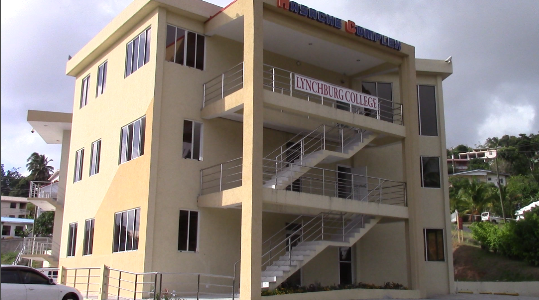 University of Lynchburg has undertaken this significant extension because of positive feedback from the programs the College has offered on site in St. Lucia as well as the programs in which St. Lucia citizens have participated on LC’s main campus. “We are committed to providing high quality programs that will meet the individual needs of students and the broader needs of the nation of St. Lucia and the Eastern Caribbean,” Dr. Polloway said. He added that the new St. Lucia branch also provides a unique study abroad opportunity for LC students, particularly for clinical placements and service learning opportunities in the health sciences. Classes began at the new facility in May 2014, with 18 undergraduate students and nine graduate students. Enrollment is estimated to reach 40 students by 2015. The St. Lucia campus offers a BS in interdisciplinary studies teacher education (ISTE) with a special education emphasis requiring 124 semester hours for completion and an MEd in special education (MEd SPED) that requires a minimum of 36 semester credit hours. The ISTE program is a degree completion program aimed at individuals who have completed a two-year degree. The MEd is offered to St. Lucians with a bachelor’s degree and an interest in special education. Graduate programs in educational leadership and nursing also began in October 2014, and further programs are under consideration. Jenevie (Wendy) Bailey ’08 BS, ’08 MEd ’14 EdD serves as director of LC in St. Lucia.